If you’re looking to replace your teeth, you should consider these beneficial factors about traditional, high-quality dentures. 1. Your bite will be drastically improved. Have you had missing teeth for an extended period of time? If so, you know that it can be difficult to chomp on anything without your teeth. Besides that, you can hardly chew your favorite foods. Dentures work to replace your teeth, allowing you to enjoy your favorite foods, crunchy foods, and even chewy snacks. Eliminate your anxiety about eating with other people and truly enjoy a meal again! 2. You’ll experience fewer speech problems. When major dental problems are present—like missing teeth—it can be difficult to hold a conversation. Instead of struggling with your speech, you can work to complete your smile again with dentures. This helps your speech pattern and boosts your confidence! 3. Your remaining teeth will be protected. If you have other existing teeth within your smile, you should work to keep them. Dentures complete your smile again, making sure those teeth don’t shift or experience infection that could cause them to fall out. Don’t worry if you’re fully edentulous (missing all teeth), there’s still another benefit to dentures. 4. There are implant supported dentures as an option. To gain the most permanent replacement teeth, discuss implant supported dentures—or dentures that are stabilized with the help of dental implant posts. Implant posts are placed into the jaw to permanently secure your denture to your jaw. This means that your teeth will replace both the missing tooth root below the gum line and the visible portion above the gum line, giving you the most natural looking and feeling smile again. 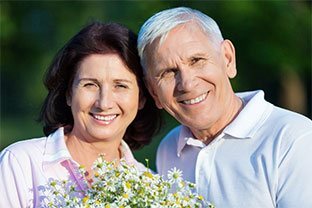 If you’re truly interested in what dentures in Tyler can do for you, feel free to contact your dentist. They will be able to evaluate your current oral health and discuss the best way to improve it, whether that be from dentures or another restorative option. Here at the dental office of Dr. Tad Morgan, we’re dedicated to making sure that our patients are in a good state of oral health. In the case that your dental health declines, we’re always available to help you recover it through a variety of treatments, procedures, and restorative options just like dentures. Learn more about how we may be able to help you by giving our office a quick call today!